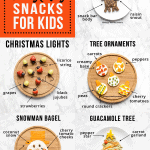 Using simple ingredients & taking only 5 minutes of your time, you can WOW your kids with these easy and healthy Christmas snacks ideas! I used to work in public health with new moms and babies in a drop-in group. Each week we would teach the moms a new baby rhyme or song to sing. We would always remind the moms that they didn’t need pretty singing voices as their babies didn’t care and just loved to hear their mom’s voice! I took that advice to heart and then SANG my heart out to my babies… much to my husband and his pitch perfect ear’s dismay! The same goes for food art! You don’t need to be a food art master and you don’t need to spend hours in the kitchen crafting the perfect design. None of these Christmas snacks took me more than 5 minutes to make. It’s a little extra time but it’s worth it to me! An invitation to play and have fun is a great strategy for exposing kids to food! As hard as it can be, it’s SUPER important to not use any force or coercion to get kids to eat food they haven’t learned to like yet. You know why? I’ll let you in on a little secret…. All taste starts in the brain. Yes, our tastebuds and sense of smell detect different chemical compounds…. but those are simply chemical compounds until our brain get the signal that they’ve been detected in the mouth and interprets them! If your brain decides ahead of time that it will not enjoy a particular taste, it will create an unpleasant response. This is why it is SO SO important to remain neutral about food! Especially with those stubborn kids…. Oops, I mean, those delightfully wonderful, strong-willed, fierce, independent kids! For more on feeding kids and help with picky eaters, follow me on Instagram or check out my e-course: Happy Healthy Eaters. How cute is this little Frosty fellow? Just like the classic way to decorate a real snowman, this guy has a carrot nose and raisin eyes and mouth! I think my favourite part though is the coconut “snow.” It’s so easy to sprinkle on but it sure takes the realism to the next level. I was really happy with how this snack turned out! Doesn’t it look exactly like a string of lights? So adorable. You might be wondering where to get just black jujubes. I actually saw that Dare now sells just the black ones in a bag on their own. I love me the black jujubes so this delights me for reasons other than this cute Christmas snack. But I actually just painstakingly chose only the round black ones out of the bulk bin! Who knew a Christmas tree snack could be so easy? Just spread some guac on a plate, add a few decorations and voila! Your kids will be so impressed with you 🙂 Serve with some nacho chips or extra veggies. The beauty with these ornaments is you can decorate them with whatever ingredients you have on hand. I went the veggie route but you could also do more of a trail mix and top with nuts, dried fruit, cheerios, etc. Let your pantry be your guide! Is it a moose or is it a reindeer? I don’t know but I’m so in love with him! I saw this idea on Pinterest a while back and snapped a screenshot of it. I really want to credit the original poster but now I can’t find out who it is! Very easy and healthy ideas to put a smile on your kids’ face! Spread a layer of cream cheese on the bagel. Slice the tomato in half and place on bagel for cheeks. Cut 2 inches off the pointy tip of the carrot. Place in the bagel hole for the nose. Grate strips of the carrot and create a hat. Press the raisins in to create eyes and a mouth. Cut the remaining carrot into sticks and serve alongside the snowman bagel. Slice the stem and a little bit of the top of the strawberries off to get a flat top. Slice a little bit of the stem side of the grapes to get a flat top. Arrange the licorice on a plate. Press a jujube on the cut side of the fruit and arrange along the licorice. Spread the guacamole on a plate into a tree shape. Using a sharp paring knife, cut out a star from the yellow pepper. Using a peeler, peel long strings of carrot. Twist the carrot strands and arrange on the guacamole to look like garland. Cut the cherry tomatoes in half and use to decorate the tree. Take 5 pretzel sticks and place vertically underneath as a tree stump. Stir together the cottage and cream cheeses. If you a mini food processor or an immersion blender you can use this to get a smooth consistency. Spread the mixture onto the crackers. Cut carrot coins and cut two diagonal mirrored lines to make the ornament top. Decorate the ornaments with frozen peas, strips of pepper, small carrot coins, and sliced cherry tomatoes. Cut the snack bar in half. In one half, cut out a little square shaped notch for the head to rest in. Cut the other half in half again. Cut one of the quarters into quarters (for the legs). Place the other quarter into the notch as the head. Place the cut-out notch as a tail. Arrange the quartered quarter as legs. Cut the apple in half, just shy of the core. Cut a slice out of the part without the core. Cut the slice in half and then cut out little squares in the cutside like the top of a fortress castle. Add chocolate chips for eyes. Cut a half circle out of another slice of apple and place as a snout. Cut the raisin in half and arrange as nostrils in the snout. Cut up the rest of the apple and serve alongside the reindeer.